Unemployment in Scotland fell by 5,000 to 234,000 in the three months from August to October, according to official figures. However, the number of Scots claiming Jobseeker's Allowance rose by 300 from October, to 135,600 in November. The unemployment rate in Scotland stands at 8.7%, compared with a UK rate of 7.9%. 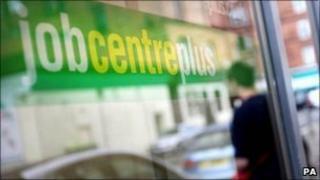 The number of people out of work in the UK rose by 35,000, to more than 2.5 million in the three months to October. Secretary of State for Scotland Michael Moore said: "Returning the economy to sustainable economic growth is the government's overriding priority. "We have done a lot already but will continue to work hard to secure a healthy economic recovery throughout this parliament, setting the conditions to foster sustainable and balanced economic growth." Employment in Scotland increased by 17,000 over the quarter to October and fell by 40,000 over the year, to stand at 2,472,000. Scottish Enterprise Minister Jim Mather said: "Today's figures show a fifth consecutive reported rise in employment in Scotland - and this trend is now having a welcome and positive impact on unemployment, which has fallen for the first time in a year, and is the largest quarterly decline for more than two years." He added: "While these trends are welcome, recovery in Scotland remains fragile - we must continue to bring unemployment down, and the UK government is wrong to threaten these positive signs by cutting the Scottish budget by some £1.3bn next year." The Scottish Chambers of Commerce (SCC) described the fall as a "welcome seasonal boost". SCC chief executive, Liz Cameron, said: "However, our overall unemployment rate still exceeds the UK average and we still have concerns regarding how the impending VAT increase and public spending cuts might affect the Scottish economy in the New Year. "Businesses will continue to require government to provide a competitive environment for them to grow and flourish, creating new and sustainable jobs in Scotland."